Therapeutic protein formulation is no easy task. Biological drugs may be destined for prefilled syringes or glass vials, or they may be made into lyophilized powders that will be reconstituted in a clinical setting. No matter what their final state will be, recombinant proteins must remain potent and efficacious during storage. In recent years, pharmaceutical companies have turned increasingly to high-concentration protein formulations. Such drug formulations can offer patients the convenience of self-injection — instead of a trip to the hospital for an intravenous infusion treatment. But these new formulations present a problem. Higher concentrations can exacerbate already existing tendencies for proteins to behave poorly. Such formulations are more likely to form aggregates that can reduce potency or even, perhaps, incite an immune-system responses. High-concentration formulations also tend to be more viscous, which can interfere with the plunging action of prefilled syringes. These principles apply to all proteins: monoclonal antibodies, vaccine components, enzymes, and so on. “There’s no such thing as a well-behaved protein,” says Tom Laue, director of the University of New Hampshire’s Biomolecular Interaction Technologies Center. Clinicians and patients are both pushing for subcutaneous delivery of biologic medications. Subcutaneous injection is easier to perform than intravenous injection as well as less expensive, and such drugs could be administered in a clinic or even at home, rather than in a hospital. A subcutaneous formulation must deliver the same dose of medicine in a 1-mL or 2-mL syringe that is delivered by a much higher volume of 250 mL or more in IV infusion — because intravenous formulations can be lower in concentration. Doses of 100 mg/mL or more are routine in the high-concentration field, but they can go much higher. For an example of the competitive advantage that can come with a good formulation and delivery method, you need look no further than at drugs that target the proprotein convertase subtilisin/ kexin type 9 (PCSK9). This protein breaks down the low-density lipoprotein (LDL) receptors that otherwise remove excess cholesterol from the body. Pfizer, Amgen, Sanofi, and Regeneron all have clinical programs working with anti-PCSK9 antibodies. And Amgen recently announced that its drug reduced patients’ LDL by 55–66% in clinical trials. Alirocumab, in codevelopment with Sanofi and Regeneron, cut levels by around 47%. Those drugs are likely to be intended for patients who are unable to take statins or who have inherited high-cholesterol levels. Given the similar efficacy of the two antibodies, drug delivery is likely to be a key differentiator between them. “The PCSK9 antibodies we’ve seen data for so far are not much differentiated in efficacy and safety,” Mark Purcell, an analyst with Barclays, wrote in a note to clients (4), “making dosing convenience a potential source of competitive advantage once multiple agents are on the market.” The companies are all developing injection devices that they hope will be easy for patients to use while minimizing injection volume. Amgen is taking a dual track with a spring-loaded auto-injector and a disposable topical device. The latter will include an adhesive backing that allows patients to place it on their skin and then press a button to inject the drug. Sanofi is developing an autoinjection pen and a prefilled syringe, both of which it will be testing in clinical trials. Pfizer is also developing an autoinjector device. In biotherapeutics development, selecting the right candidate proteins from discovery involves a number of physicochemical testing processes intended to eliminate molecules that could have formulation, delivery, or manufacturing problems later on. Often only small amounts of material are available for these analytical tests, and parameters such as viscosity and physicochemical stability of formulations become critical quality attributes (CQAs) that determine whether a molecule is selected for further investment. Because most biological molecules are unable to withstand the rigors of gastrointestinal delivery, most are administered through intravenous, intramuscular, or subcutaneous injection. Concentrations of the active molecules must be high — typically ≥100 mg/mL — to compensate for short plasma half-lives. One major challenge is to develop high-concentration formulations (for maximum effectiveness) that can be injected at low volume (for patient comfort). High concentration of biopharmaceuticals often creates high viscosity and potential stability/delivery problems. Determining viscosity at a very early stage is therefore crucial. A new instrument (Viscosizer 200) for such measurements combines ultraviolet area imaging with microcapillary viscometry to deliver rapid, high-throughput, and nondestructive viscosity and molecular size measurements for biopharmaceutical formulations. It is an early development from the Bioscience Development Initiative established by Malvern Instruments. Through that program, Malvern partners with industry and academia to rapidly identify and assess analytical problems and bottlenecks within biopharmaceutical development and manufacture, then to identify, prototype, and deliver solutions (1). 1 Lewis EN. How to Hit a Moving Target. BioProcess Int. 11(11) 2013: 42–46. Other Applications: Even if the final drug product isn’t high in concentration, proteins can be at high concentrations during their manufacturing processes. For example, in ion-exchange column chromatography, the process-stream concentration may be kept high to reduce volume and speed up the purification process. First and foremost among the problems presented by highly concentrated formulations are viscosity and aggregation. “Those are the two very big issues that everybody talks about,” says Bukrinski. Protein characteristics that affect the potential for both viscosity and aggregate formation include hydrophobicity, charge patches and dipole interactions, and self-association. Burge agrees. “You just can’t go beyond a certain viscosity. Because they’re smaller than typical syringes, prefilled syringes need to have higher protein concentrations to meet dosage requirements, so their formulations have higher viscosities.” Viscosity also causes problems during manufacture and purification, for example by hindering filtration steps. “There, viscosity is a huge problem,” says Bukrinski. Aggregated protein particles can gum up the works during purification operations, cause denaturation and thus affect clinical potency, or even prompt an immune response in recipient patients. “You want to make sure your drug does not associate in the formulation, or if it does, it does so in a reversible manner and dissolves relatively quickly,” says Laue. “We don’t have a good understanding of the properties of aggregates that can lead to an immune response,” Topp points out, “so it’s difficult to pin down what to measure.” In fact, disagreement remains over the significance of aggregates, at least when it comes to immunogenicity. Biotechnology industry representatives have argued that aggregates were a problem in products such as antibodies and blood isolates, the earliest of which were less pure than today’s biologics. Those early problems, in addition to more current data, have regulators and researchers such as Topp concerned that immune responses are still an issue. One example is pure red cell aplasia (PRCA) apparently caused by aggregates in Johnson &amp; Johnson’s Eprex erythropoietin product, which is used to treat anemia associated with chronic kidney disease (5). Before 1998, three reports suggested that the product could cause an immune response against the therapeutic protein that could cross-react with endogenous erythropoietin. In 1998, Johnson &amp; Johnson modified the formulation for products marketed outside the United States, replacing human serum albumin as a stabilizer with polysorbate 80 and glycine. By 2002, the number of reported PRCA cases had jumped to 112, so the company withdrew the product from the market. An analysis suggested that polysorbate 80 leached molecules from uncoated rubber stoppers in Eprex syringes. Those leached molecules may have acted as adjuvants, encouraging an immune response. More recently, two cases of PRCA arose as a result of subcutaneous administration of the biosimilar epoetin HX575 to patients with chronic renal failure during a premarketing trial. That problem may have occurred as a result of tungsten contamination during syringe manufacture. The metal contaminant may have caused denaturation and aggregation, which in turn could have caused an immune response (6). Measuring Aggregates: Such concerns have prompted the US Food and Drug Administration (FDA) and many biopharmaceutical companies to emphasize measuring aggregates in protein drug products, particularly focusing on the subvisible size range. Many analytical techniques are available for doing so, but they don’t produce consistent results across platforms. Methods include dynamic light scattering (DLS), resonant mass measurement, Coulter counting, microflow imaging (MFI, Figure 1), field-flow fractionation (FFF), atomic force microscopy, analytical ultracentrifugation, and nanoparticle tracking analysis. A protein’s solubility and viscosity both depend on proximity energies at particle interfaces. Higher concentrations reduce the interstitial spaces, increasing the effects of proximity energies. Attractive and repulsive forces affect the tendency for proteins to stick together. Van der Waals interactions are repulsive and operate at very close range. Hydrogen bonds and various dipole interactions are attractive forces that must be minimized to reduce aggregation and viscosity. Two forces can be either attractive or repulsive, depending on circumstances. Charge–charge interactions are repulsive for same electrical charges or attractive for opposite charges. Desolvation energy involves expulsion of solvent molecules (typically water) from the space between two particles as they push closer together. On hydrophobic surfaces in an aqueous solution, desolvation can occur very rapidly, bringing surfaces close together and heightening viscosity. But in the presence of carboxyl groups, water molecules form hydrogen bonds with protein surfaces and stay put. The water molecules then cannot displace one another, which creates a buffer zone between proteins and discourages aggregation, keeping viscosity low. Excipients such as detergents can reduce protein– protein interactions by binding hydrophobic areas. Increasing salt concentration of a solution weakens all electostatic interactions. So adding salt may increase aggregation by weakening charge–charge repulsion or decease it by weakening dipole attractions. Dipolar excipients (e.g., arginine) raise the dielectric constant and weaken all electrostatic interactions. “The methods can give conflicting results,” says Topp, “and no one really knows which is right. That makes it difficult to calibrate across instruments and makes the picture even more cloudy.” The problem is complicated by a lack of reference standards for protein aggregates in the relevant size range: roughly between 2 nm and 1 µm in size. Larger particles can be detected using light obscuration, but this method is limited in range to those at least 1 µm in size. “It has been known for a long time that light-obscuration doesn’t catch all particles,” says Topp. At the other end of the scale, high-performance liquid chromatography (HPLC) is adept at measuring small particles up to 5 nm — from monomers and dimers up to about multimers of 10 proteins or so. Championed by ProteinSimple, microflow imaging uses digital microscopy and microfluidics to collect images of particles in solution. The ProteinSimple system creates a database of particle count, size, transparency, and morphology. Particles can be accurately sized at 1 µm and larger, with morphology quantitative at 5 µm and larger. But there remains a gap between 100 nm and 1–2 µm for which few reliable technologies are available. Some new techniques are making inroads into that range. Nanosight nanoparticle tracking analysis (NTA, Malvern Instruments) uses laser light-scattering to analyze particles in the 10- to 200-nm range. From a scattering pattern, the system’s software infers Brownian motion of particles, which in turn is used to calculate each particle’s hydrodynamic radius. The instrument measures each particle individually. Another approach in this size range is resonant mass measurement, as represented by the Archimedes instrument, also from Malvern. According to the company, it detects and counts particles in the size range of 50 nm to 5 µm. As a sample flows through a microfluidic chamber, particles come into contact with a tiny cantilever that resonates with a specific frequency. The subtle shift in frequency caused by each particle allows calculation of that particle’s buoyant mass, dry mass, and size. Those traits allow the instrument to distinguish between protein aggregates and leachable contaminants such as silicone oil. DLS can detect very small particles, but it can’t count them, and its results might be skewed because large particles can interfere with the light scattering of smaller particles. A mixture of particle sizes can muddy the results. On the other hand, techniques such as size-exclusion chromatography (SEC) and analytical ultracentrifugation can disrupt aggregates during the analysis. “What you measure may not be what you initially had in the sample,” says Topp. Robustness — that is, repeatability with reliable accuracy — would be a boon to laboratories that struggle with irreproducibility of aggregate measurements. It’s challenging because aggregates are affected by many factors, including solution pH and the size and number of dilutions. With all protein formulations, the choice of container is important. But it’s even more critical with high protein concentrations. Stoppers and needles might contain leachable components such as metals and synthetic polymers and additives that could seed particle formation or cause product degradation. Proteins can be the instruments of their own demise because they sometimes act like detergents. At PepTalk 2014 in Palm Springs this past January, Wenjin Cao (Amgen, Inc.) presented “Mitigating the Challenge of Slow Reconstitutiton of Lyophilized High-Concentration Protein Formulations” based on teamwork with coauthors from Amgen, Gilead, Hospira, and Regeneron Pharmaceuticals. Cao explained that lyophilized highly concentrated protein formulations can take a long time to reconstitute, which can limit their practical use and commercial marketability. Cao discussed a systematic approach to facilitating reconstitution of a 57-kD, 100-mg/mL Fc-fusion protein with stability issues that necessitated freeze drying. Many strategies can provide nominal improvement in reconstitution times: e.g., adding wetting agents to diluents, incorporating high-annealing steps in the lyophilization cycle, and reconstitution in a vacuum. Cao reports that reducing the diluent volume has significantly decreased reconstitution time by four to seven times for some highly concentrated protein formulations. The team’s efforts to improve reconstitution time for their product included correlating lyophilized cake porosity with reconstitution time (and using diluents to shorten it); characterizing the lyophilization cycle (inducing mannitol crystallization to shorten reconstitution time); and exploring multiple reconstitution strategies (with half the fill volume and under vacuum). They found that reconstitution times correlate to cake crystallinity: Partly crystalline cakes reconstitute faster than amorphous ones. And highly concentrated formulations usually make for amorphous freeze-dried cakes — for which dissolution typically follows a slow erosion of the cake structure. Ultimately, the team discovered that highly concentrated protein formulations need a lot of sucrose for sufficient stabilization. That translates to long reconstitution times, which made the formulations sensitive to reconstitution procedures, posing some difficulty in clinical settings. Some diluents (particularly high-concentration surfactants) reduced reconstitution time, but not significantly. Modifying the annealing step of the lyophilization process didn’t change crystallinity or reconstitution time much. But half-volume reconstitution did. Types of Container: High-concentration protein formulations can present difficulties when used with parenteral devices. When such a formulation encounters the surface of a plunger, a barrel lubricant, or contaminants left over from device manufacturing (e.g., tungsten particles), aggregation could result (7). Metals such as tungsten can leak from even treated rubber stoppers. Glass prefilled syringes can introduce silicone oil droplets, tungsten, and container components that negatively affect proteins. “It can be as innocuous as a few droplets of oil that don’t harm the patient,” says Burge, “or these things can cause real problems for the proteins that could make them less safe or [reduce] their efficacy.” Leachables are a significant enough consideration that companies such as Becton Dickinson and Vetter Pharma (both of which design custom syringes, auto-injectors, and other delivery vehicles) include a leachables profile along with each device they develop. Excipients can help, but only a few are applicable for reducing leachables in parenteral formulations. Metal chelators such as ethylenediaminetetraacetic (EDTA) and diethylenetriaminepentaacetic (DTPA) acids can assist formulators with these problems, as can antioxidant amino acids such as methionine or cysteine. But better devices would present an ideal solution. “There’s more emphasis built into the device side now,” Bilikallahalli says, “trying to come up with more compatible systems that can carry a number of biologic molecules such as vaccines, cell and nucleic-acid therapeutics, and proteins.” Some efforts to coat needle surfaces to prevent leaching are also in progress. In recent years prefilled syringes have gained momentum within the biopharmaceutical industry. Burge describes an industry-wide move toward them. Meanwhile, transdermal microneedles are also gaining interest. Some studies have suggested that transdermal administration can lead to better uptake into the lymphatic system than traditional subcutaneous injection provides (9, 10). More studies need to be done on a broad range of formulations, but Burge suggests that current data indicate that this mode of drug delivery could have great potential. Materials: Containers can be made of glass or plastic. The latter is popular in earthquake-prone places such as Japan as well as with companies desiring lighter-weight inventory. High-concentration formulations increase the potential for material loss. “Japan lost hundreds of millions of dollars to the 2011 earthquake,” Burge reports. Plastic syringes don’t shatter easily, and they can have fewer [different] leachable components than glass. European and American companies still mainly use glass syringes, but Burge points out that many acknowledge the associated challenges (8). Plastic has its own drawbacks. It can be permeable to oxygen, and some proteins are more likely to adhere to a plastic surface than a glass one, which can potentially lead to instability or degradation. Terumo Medical is a leading supplier of plastic syringes and has amassed great experience in working with proteins. Antibody–drug conjugates (ADCs) face some unique formulation problems. The same degradation pathways are likely to be found for both naked and conjugated antibodies, but the linkers that bind toxins to antibodies can be troublesome. Those links are not always stable, and their failure can cause free protein to leak into solution. In some cases, this may necessitate a lyophilized formulation. Linker technologies generally use either the side-chain amino group of a lysine or the sulfhydryl side chain of a cysteine. The latter is typically more stable in liquid formulations because the chemistry that targets cysteines is more specific than that targeting lysines. As a result, when lysine is used, off-target amino acids can be conjugated to the linker. In a liquid environment, those tend to form less-stable covalent bonds than does cysteine, according to Juan Davagnino, senior director of biopharmaceutical development at KBI Biopharma. Depending on the chemistry used by a given conjugation, the formulation group can determine whether a liquid or lyophilized formulation will be necessary. ADCs also face solubility issues. The more toxins are bound to an antibody — the higher the drug–antibody ratio (DAR) — the more hydrophobic the final product tends to be, and that reduces solubility. The number of links per antibody inevitably varies, so each product is a mixture of molecules with different numbers of toxins attached. Those with more toxins tend to come out of solution first, another factor that often leads to lyophilization as the formulation of choice. Because of those issues, ADCs are seldom used at higher concentrations. So ADCs are unlikely to be used subcutaneously, according to Davagnino. However, high amounts are still required for dose-escalation studies. Chen B, Zapata G, Chamow SM. Strategies for Rapid Development of Liquid and Lyophilized Antibody Formulations. BioProcess Int. 2(1) 2004: 48–52. Scott C. Formulation Development: Making the Medicine. BioProcess Int. 4(3) 2006: S42–S56. Garidel P, Schott H. Fourier-Transform Midinfrared Spectroscopy for Analysis and Screening of Liquid Protein Formulations. BioProcess Int. 4(5–6) 2006: 40–46; 48–55. Apostol A, Kelner DN. 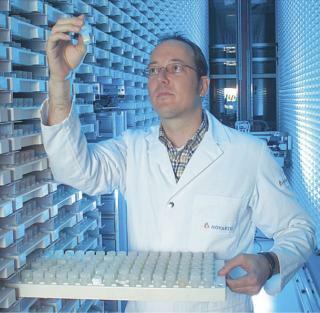 Managing the Analytical Lifecycle for Biotechnology Products. BioProcess Int. 6(8) 2008: 12–19. Maggio ET. Novel Excipients Prevent Aggregation in Manufacturing and Formulation of Protein and Peptide Therapeutics. BioProcess Int. 6(10) 2008: 58–65. Zabrecky JR. Why Do So Many Biopharmaceuticals Fail? BioProcess Int. 6(11) 2008: 26–33. Sharma DK, Oma P, King D. Applying Intelligent Flow Microscopy to Biotechnology. BioProcess Int. 7(6) 2009: 62–67. Bursac R, Sever R, Hunek B. A Practical Method for Resolving the Nucleation Problem in Lyophilization. BioProcess Int. 7(9) 2009: 66–72. Boehner R. A Formulation Strategy for Quickly Reaching Clinical Trials. BioProcess Int. 7(10) November 2009: 10–14. Garidel P, Kebbel F. Protein Therapeutics and Aggregates Characterized By Photon Correlation Spectroscopy. BioProcess Int. 8(3) 2010: 38–46. Rios M. Combination Products for Biotherapeutics. BioProcess Int. 9(2) 2011: 27–35. Mire-Sluis A, et al. 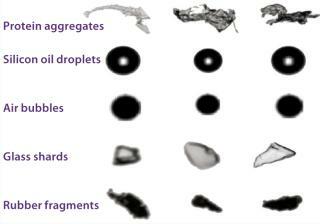 Analysis and Immunogenic Potential of Aggregates and Particles. BioProcess Int. 9(10–11) 2011: 38–47; 38–43. Reynolds G, Paskiet D. Glass Delamination and Breakage. BioProcess Int. 9(11) 2011: 52–57. Scott C. Robots in the Laboratory. BioProcess Int. 11(10) 2013: 22–25. Ridgway A, et al. Biosimilar Products. BioProcess Int. 11(10) 2013: 12–20. Those issues call for extensive screening of different formulations, extended development timelines, and sometimes even novel excipients not used with most antibodies. At present, all these novel proteins are still in early development at several companies, so for now, higher concentrations will be needed largely for their dose-escalation studies. A number of excipients can be added to formulations to stabilize proteins by suppressing aggregation and surface adsorption. In liquid formulations, buffers with phosphate or histidine and a small amount of detergent can be useful. Excipients for lyophilized formulations include sucrose, trehalose, mannitol, and glycine, among others. microbial growth inhibitors such as benzyl alcohol. However, some researchers are pushing the field forward. Topp’s group is working on novel excipients designed to cover exposed hydrophobic residues on the surfaces of proteins. Their goal is to stabilize the native protein structure by preventing hydrophobic interactions that can lead to aggregation. These excipients — called artificial chaperones — mimic naturally occurring protein ligands, to act as a protective coating over aggregation-prone sites on the molecules. 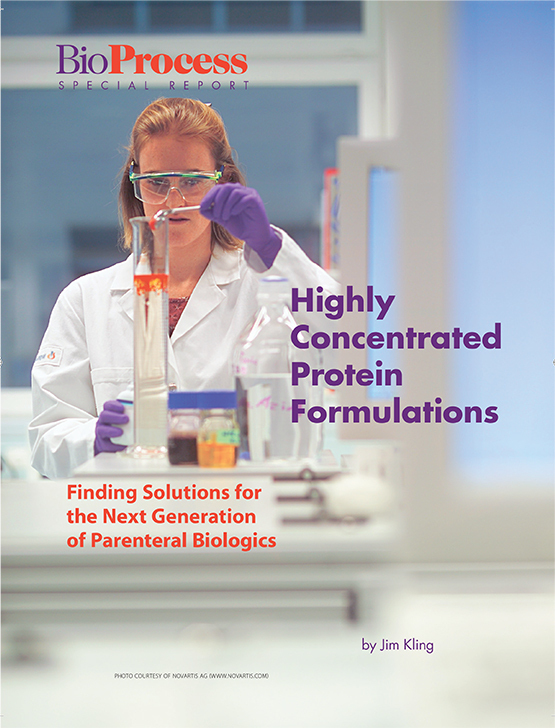 The challenges of highly concentrated protein formulations are not likely to be resolved any time soon. Most of these problems are solvable, however; formulation troubles rarely undermine a drug development program to failure. However, they can add time and expense to that program, and ultimately they could limit formulation applications for some drugs. But new excipients, technologies, assays, and containers should help manufacturers circumvent these potential roadblocks. They’d better, Burge warns. “I don’t think the pressure from clinicians or from pharmaceutical companies is going to go away.” Highly concentrated formulations are the inevitable next generation of parenteral biologics. Based in Bellingham, WA, Jim Kling is a freelance science writer with a background in organic chemistry and over a decade of experience covering topics from biotechnology to astrophysics to archeology. His credits include WebMD, The Washington Post, Scientific American, Technology Review, and Science magazine. He also occasionally writes science fiction; jkling@gmail.com. 1.) Beck, A. 2010. Strategies and Challenges for the Next Generation of Therapeutic Antibodies. Nat. Rev. Immunol. 10:345-352. 2.) An, Z 2009.Therapeutic Monoclonal Antibodies: From Bench to Clinic, John Wiley &amp; Son, Inc, Hoboken. 3.) Shire, SJ, Z Shahrokh, and J Liu. 2004. Challenges in the Development of High Protein Concentration Formulations. J. Pharm. Sci. 93:1390-1402. 4.) Armstrong, D, and MF Cortez. 2014.Amgen Drug Slashes Bad Cholesterol Within Weeks of Treatment Bloomberg News. 5.) Boven, K. 2005. The Increased Incidence of Pure Red Cell Aplasia with an Eprex Formulation in Uncoated Rubber Stopper Syringes. Kidney Int. 67:2346-2353. 6.) Seidl, A. 2012. Tungsten-Induced Denaturation and Aggregation of Epoetin Alfa During Primary Packaging As a Cause of Immunogenicity. Pharm Res. 29:1454-1467. 7.) Liu, W. 2010. Root Cause Analysis of Tungsten-Induced Protein Aggregation in Pre-filled Syringes. PDA J. Pharmaceut. Sci. Technol. 64:11-19. 8.) DeGrazio, F, and D Paskiet. 2012.The Glass Quandary Contract Pharma. 9.) Verbaan, FJ. 2007. Assembled Microneedle Arrays Enhance the Transport of Compounds Varying Over a Large Range of Molecular Weight Across Human Dermatomed Skin. J. Control. Release. 117:238-245. 10.) Wu, X, H Todo, and K Sgibayashi. 2007. Enhancement of Skin Permeation of High Molecular Compounds By a Combination of Microneedle Pretreatment and Iontophoresis. J. Control. Release. 118:189-195. 11.) Adler, M 2012.Challenges in the Development of Pre-Filled Syringes for Biologics from a Formulation Scientist’s Point of View Am. Pharmaceut. Rev. 12.) Alford, JR. 2004.PhD Thesis: Physical Stability of a Therapeutic Protein in High Protein Concentration Aqueous Formulations, University of Colorado, Boulder. 13.) Bhambhani, A, and JT Blue. 2010.Lyophilization Strategies for Development of a High-Concentration Monoclonal Antibody Formulation: Benefits and Pitfalls Am. Pharmaceut. Rev. 14.) Chi, EY 2012.Excipients and Their Effects on the Quality of Biologics AAPS J. 15.) Shire, SJ, Z Shahrokh, and J. Liu. 2004. Challenges in the Development of High Protein Concentration Formulations. J. Pharmaceut. Sci. 93:1390-1402. Thank you so much for providing such an informative article. As a company specializing in high concentration formulation development, we agree that this is a problem for some development stage compounds and an opportunity for lifecycle management. Currently only three products have been approved at 200mg/ml but many other firms are interested in reaching these levels to fit in syringes or small pumps. Patients have rewarded innovators in IgG when they have reduced volumes and made chronic therapy easier. EXCELSE technology provides another option not mentioned in the article.